You will face many situations where you're seemingly over-matched against a superior opponent. Possibly you’ve heard about how good some player is or (at higher levels) read newspaper articles praising the player’s talent. Before your game, you may observe how big, tall, or strong your opponent appears. You may notice how the player seems to smoothly execute skills during warm-ups. The player or team may have all of the clothing and equipment “accessories,” suggesting that they’re well prepared and know what they’re doing. But once a game begins, you will often find that many of the apparent advantages your opponent holds over you are mere illusion. Although physically impressive and athletic, your opponent may not understand how to play the game. Your opponent may also lack a competitive character that equals yours. For example, the tennis player, owner of multiple racquets (in plastic wrap) and beautiful ground strokes, may also possess a game that falls apart at the first sign of pressure. You will encounter many situations where appearances don’t match actual ability. Do not put your opponent in the winner’s circle or assume you have some inherent disadvantage based on appearances. What seems impossible is sometimes possible. One of the most amazing examples of an athlete performing above their apparent talent level happened in the 1968 Olympics when a long jumper named Bob Beamon won the gold medal. In a track event where the world record was regularly broken by a couple of inches, Bob Beamon jumped 29 ft. 2 ½ inches, 21 ¾ inches better than the prior world record. Don’t underestimate your possibilities to perform at a higher level when challenged. 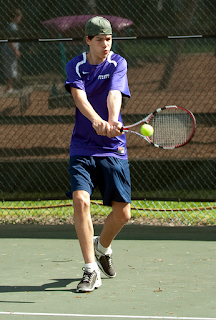 One of my best moments in sports came in a high school tennis doubles match. My partner (Terry) and I were facing the first and second singles players from a nearby school, with the winner advancing to the sectionals tournament. We were the clear underdogs. Our opponents walked out onto their home court, dressed like Roger Federer, each carrying two of the best tennis racquets of that time. They were confident, relaxed, and looked every bit the product of many tennis lessons and year-round play. For our part, Terry and I had decent strokes and net games, but we depended more on our general athleticism than grooved groundstrokes. As the match began, our opponents quickly asserted their dominance. Before long they started acting cocky, joking and carrying on in a disrespectful way. After losing the first set, I remember becoming mad at both our play and our opponent’s smug, casual attitude. I turned to Terry and said, “Let’s go. We’re better than this!” We began to run down every shot, keeping the ball in play, and letting our opponent’s overly confident attitude catch up to them. Slowly, the points started going our way. Our play became more aggressive and confident. I can’t recall whether I exchanged any words with them, but there were certainly some looks across the net that said, “Okay, let’s see what you can do now.” As the tide turned, they were unable to recapture their smooth strokes and high level of play. As often happens when the momentum of a game shifts, they began to feel the pressure. We beat them convincingly in the third set to win the match. Interestingly, I again played one of our opponents in a sectional team playoff a week later. Although he still owned those beautiful strokes, our previous doubles match had destroyed his confidence. I easily beat him in two sets. Remember that your opponent’s apparent excellence is sometimes only a thin veneer covering substantial defects in his or her game. And though you will face superior opponents, there are often ways to compensate for your shortcomings. Instead of accepting your supposed disadvantage, relish these challenges and opportunities to succeed. You may create a proud memory that lasts a lifetime.